•	Tax-to-GDP ratios in 2015 ranged from 10.8% in the Democratic Republic of the Congo to 30.3% in Tunisia, with an average of 19.1% across the 16 countries. This is lower than the Latin American and Caribbean (LAC) and OECD averages (22.8% and 34.3%, respectively). •	Between 2014 and 2015, all featured countries except Kenya, Tunisia and Morocco increased their tax-to-GDP ratios. On average, they increased their tax-to-GDP ratios by 0.4 percentage points, a slightly lower increase than for the LAC average (0.6 percentage points) but above the OECD average (less than 0.1 percentage points). •	All countries in the publication had higher tax-to-GDP ratios in 2015 than in 2000, and all have increased more than the OECD average. Since 2000, the average tax-to-GDP ratio has increased by 5.0 percentage points, a similar increase to the LAC average (4.9 percentage points). In contrast, the OECD average grew by just 0.3 percentage points over this period. •	Taxes on goods and services were the principal source of total tax revenues in 2015 (57.2%, on average) and particularly VAT (31.5% on average). The share of revenues from taxes on income and profits amounted to 32.4%, on average. 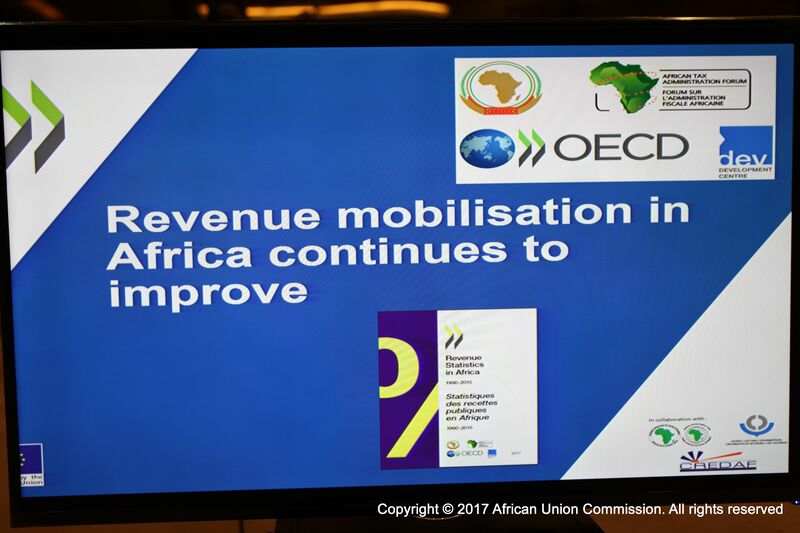 •	Kenya, South Africa and Swaziland obtained about half of their tax revenues from taxes on income and profits in 2015 whereas among the other 13 countries, this category ranged from 18.6% in Togo to 37.6% in Rwanda. •	Tunisia and Morocco reported the highest share of social security contributions among the 16 countries in 2015 (29.5% and 17% respectively). •	The African countries featured in this publication have significantly lower social security contributions than LAC countries. This accounts for most of the difference between their respective average tax-to-GDP ratios. •	The total non-tax revenues collected as a percentage of GDP ranged from 0.6 % of GDP for South Africa to 15.1% of GDP for Swaziland (mostly revenues from the Southern African Customs Union). In every country, non-tax revenues were lower than tax revenues. •	Of the 14 countries for which non-tax data is available over the past ten years, eight have shown a decreasing trend in non-tax revenue to GDP ratios, and only six have shown an increasing trend. •	Non-tax revenue collections show a much higher rate of annual variation than tax revenues, sometimes varying by over 1% of GDP from one year to the next. •	The annual variation in non-tax revenue is often due to the volatility of grant and property revenues. In 2015, grants made up 7.2% of Niger’s GDP and 6.3% of Rwanda’s GDP. Property revenues made up 2.8% of Cameroon’s GDP, mainly from rents and royalties.